The Film Sufi: Aesthetics of Two Neorealist Films: "Open City" and "Paisan"
Aesthetics of Two Neorealist Films: "Open City" and "Paisan"
Critical consideration of certain Italian post-war films referred to as Neorealist must perforce deal with rather fundamental questions concerning the nature of the cinematic experience. Unfortunately there is a lack of general agreement as to what actually co nstitutes Neorealism, since the films have been interpreted on several different levels. However, art movement categories frequently suffer from problems of definition, and, usually it is a case of the old logician’s problem of whether to characterize the class by its defining statement or by its individual members. In the case of Neorealist films, it seems that the weight of opinion has expressed itself in terms of the latter choice, and Neorealism is generally taken to apply only to the specific post-war films of Rossellini, De Sica, Visconti, Lattuada, and a few others. Such a classification would not be interesting in terms of film theory unless there were certain common cinematic characteristics among these films, and such is the case for the Neorealist films for which there is a persistent critical opinion which asserts that conditions in Italy after the war were such as to engender a common cinematic expression. Potemkin turned the cinema world upside down not just because of its political message, not even because it replaced the studio plaster sets with real settings and the star with an anonymous crowd, but because Eisenstein was the greatest montage theoretician of his day, because he worked with Tissé, the finest cameraman of his day, and because Russia was the focal point of cinematographic thought. . .
“above all a moral standpoint from which to view the world. Afterwards it becomes an aesthetic viewpoint." This merely reflects the fact that the expression of an amoral standpoint can have profound aesthetic consequences, consciously intended or not. In general, reality is reduced to the most simple patterns at the moment of perception. A certain “reduction” of reality takes place. Much of the history of modern painting is concerned with artists’ attempts to deal with the formal perception of the world as opposed to reality as it appears unanalyzed (as it might appear in a photograph). Similarly most of the advances in film technique have been concerned with ways of presenting a reduced or analyzed version of reality on screen – analyzed so that certain formal and thematic connections can be made by the viewer and so that the film itself can become a statement by the author. 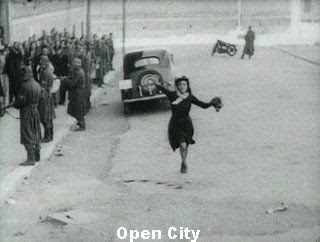 As stated above, the important scenes in Open City and Paisan present the world in a relatively unanalyzed state and run counter to the, up to then, historic course of cinematic expression. Though at first thought this might merely seem to be a retrogression in film technique, there is another consideration. With virtually every mode of artistic expression (except music), there is a delicate balance that must be maintained between the referential reality and the language or grammar of expression. To elaborate on this, let us consider an idea from gestalt psychology – that reality is perceived structurally and this structure is the simplest pos sible for the circumstantial stimuli . From such an idea it is quite reasonable to speculate that what we might call the most admirable “statements” about the world are those that can be applied to the greatest amount of reality and yet have the simplest attendant structure. Certainly such a principle dominates the ascendency of theories in the scientific world, and something similar is involved when we admire a Shakespearean play for its universality and profundity – here the structure of the play applies to a wealth of human situations that have existed in the world over centuries. The delicate balance between the referential reality and the language of expression means that the language should be profound (possess a significant abstract structure) and yet be directly applicable to concrete reality. The more general the abstraction present, the more widely applicable is the structure to reality, but at the same time the further removed is that structure from concrete reality. The danger exists in allowing the language of expression to become disengaged from concrete reality. [the representation of reality on the screen] is a necessary illusion, but it quickly becomes identified in the mind of the spectator with is cinematographic presentation. As for the filmmaker, the moment he has secured the unwitting complicity of the public, he is increasingly tempted to ignore reality. From habit and laziness he reaches the point when he himself is no longer able to tell where lies begin or end. There could never be any question of calling him a liar, because his art consists in lying. The aesthetic ideas presented so far have been quite general, and they naturally manifest themselves differently in different art forms. When Bazin  says that “the cinema stand in contrast to poetry, paining, and theater, and comes ever close to the novel” , he means that the power of the film to represent reality can most closely be compared to that of the novel. There is a danger, however, in drawing this analogy too closely, because the novel’s communication through words is always a highly abstract process. Even if the novel is more concrete than poetry or theater, it still involves the author’s translation of his perceptual reality into linguistic symbols and the ensuing reverse translation by the reader into his own perceptions. Such an abstract process always involves a considerable degree of analysis by the mere use and choice of words independent of grammatical style and is thus less immediate than film. Film, however, is a medium wherein reality can be presented almost without analysis – the balance can be lost in the other direction in this case. "they strove to make the film as much like life as possible. Therefore its hour and half contains moment of pathos and humor and excitement together with long stretches that are not particularly interesting. Just like your life and mine." Such was the result when Zavattini tried to put his own doctrinaire theories about Neorealism into practice. The Rossellini sequences, on the other hand, are outstanding, because they do represent a distinct point of view (the filmmaker’s statement about reality) and yet effectively root the viewer in concrete perceptions (contrary to previous films which had become increasingly abstract and grammatical). The thematic current that runs through the films is the idea that heroism consists not of accomplishment but of resignation to one’s fate, coincident with the m aintenance of one’s moral commitments. When the priest and the Communist both die for their cause in Open City, they do so with a peculiar sense of peace, giving us the feeling that they have achieved, through their resignation, some degree of perhaps Christian transcendence. Critics have tended to isolate Rossellini’s form from his content. Thus Robert Warshow  states that “Rossellini has no intellectual defences, and when he attempts to go beyond the passive representation of experience, he falls at once into the grossest sentimentality and falsehood.” Whether false or not, Rossellini’s moral theme is inextricably intertwined with the manner of its presentation. Moreover critics take exception to Rossellini’s essentially melodramatic narrative form . Yet this melodramatic style is an essential quality for Rossellini. Rossellini organizes the plot around key events, highly dramatic events involving life and death. In the best sequences (the “Florentine” and “Po River” episodes of Paisan), the audience is given no background, no reason for the event. The unanalyzed event takes up the entire action. There are certain relationships among the characters which the audience would find useful to know, but the narrative does not point these out or slow down for audience comprehension. The action itself seems to exist independent of the filming of it, and the camera has no time to examine details. Robert Warshow points out that American films devote considerable screen time to the establishment of characterization in order that the characters, who are really abstractions, can be given the necessary background detail so that they can be individualized and so that the action can be explained in terms of the individual motivations of the characters. Rossellini, keying only on the action of a highly charged event, achieves the unanalyzed and unexplained immediacy he wants, but he does so only by being melodramatic. That is, by having such unrelenting dramatic action, Rossellini appears melodramatic. 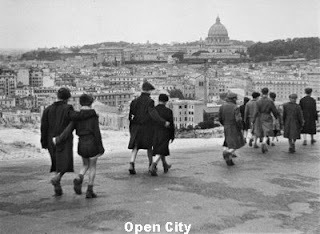 The failures, (a) in Open City of scenes involving Bergman and his coterie and (b) in Paisan of the episode involving the three American chaplains, arise from Rossellini’s use of symbolic characters, i.e. his deviation from the successful melodramatic-event narrative style. The remarkable “Florentine” and “Po River” episodes of Paisan work because they are melodramatic. The viewer is constantly perceiving violent and fragmented images (not fragmented artificially, but as they would come to a bystander) which he must assemble coherently in his mind. The analysis, performed by the viewer, would not even be undertaken if the event itself were not of sufficient dramatic intensity. In the “Florentine” episode a woman is looking for her lover in a contested part of the city. The camera maintains a consistent third-person perspective. There are no cuts to closeups. Indeed the camera seems to be somewhat wary of the danger present in the situation. The viewer thus feels himself part of the action. When two fascists are captured, they are rushed up almost too close to the camera for comfort. One feels like taking a step backwards when watching. This sense of immediacy is maintained until the woman learns of the death of her lover and the episode ends. The viewer’s knowledge of the woman and whatever her lover meant to her is constructed consistently of what can be drawn from her actions during the event. This is a limitation, but at the same time the event is so real that it seems as rich as life itself – so full of possibly meaningful, briefly glimpsed detail that still awaits our minds’ attentive reflection. This overall effect is enhanced by the elliptical succession of images. Important actions are not even shown, and the viewer must fill it in for himself, because the action is racing ahead. The entire “Po River” sequence is put together in this fashion. Also, because the viewer is putting together some of the action in his mind, the unseen events make their presence felt in succeeding scenes, just as they do in real life. An example of this shadow casting of an event is the effect of Pina’s death on the subsequent scene in Open City. The passive, eye-level camera techniques, the newsreel editing, and the naturalistic acting ultimately bring about the active perceptual participation of the viewer. The necessity of the viewer to continually analyze the event and keep up with the action harmonizes with Rossellini’s moral purpose. The various deaths reported in the “Forentine” and “Po River” episodes of Paisan seem so random and brutal, so subordinate to the larger context of the war and the rest of the real world, that we, the viewers, can only reflect upon them in our own time. Yet at the same time the characters who participate in these events are struggling on behalf of their ideals. This combination is what gives the strength to what is best in Rossellini’s films. The moral attitudes of the characters and the concrete context in which they are depicted each give substance to the other. 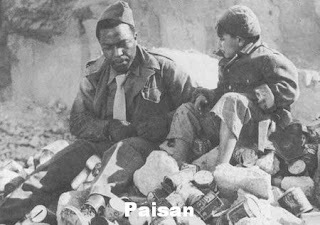 And this is the crucial point that is missed by Bazin and Warshow and which the foregoing argument has been an attempt to justify: that the potency of Rossellini’s realistic cinematography depends aesthetically on the melodramatic narrative style and the moralistic message – whether one is in sympathy with that moral message or not. Knight, Arthur, The Liveliest Art, The New American Library (1957), p. 225. Sarris, Andrew, Confessions of a Cultist: On the Cinema, 1955-1969, Simon and Schuster (1971), p. 30. Bazin, André, What is Cinema?, Volume II, University of California (1971), p. 25. Rossellini, Roberto, Interviews with Film Directors, ed. by Andrew Sarris, Avon Books (1967), p. 475. Agee. James, Agee on Film, Volume I, Grosset and Dunlap (1969), p. 301. See, for example, Rudolph Arnheirm’s book, Art and Visual Perception. (1974). 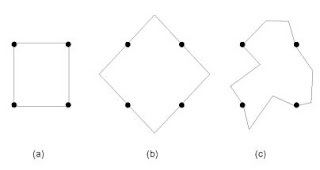 “The basic law of visual perception. . . asserts that any stimulus pattern tends to be seen in such a way that the resulting structure is as simple as the given conditions permit.” – Rudolph Arnheim, Art and Visual Perception, University of California (1954), p. 45. Bazin, André, op. cit., p. 27. Ibid., p. 31. In connection with realism and the recent course of modern literature, there is an interesting article by Tom Wolfe in the December 1972 issue of Esquire, entitled, “Why they aren’t writing the Great American Novel Anymore”, which generally supports the aesthetic outline in this article. Kauffmann, Stanley, A World on Film, Delta (1966), p. 292. Warshow, Robert, The Immediate Experience, Atheneium (1962), p. 257. “Unfortunately the demon of melodrama that Italian film makers seem incapable of exorcising takes over every so often, thus imposing a dramatic necessity of strictly foreseeable events.” – André Bazin, op. cit., p. 31.